What is Population Standard Deviation & its Purpose? Population Standard Deviation often abbreviated as PSD, is a mathematical function or method used in the context of probability & statistics often symbolized by σ which represents the measure the uncertainty behavior of entire members of a finite population or data distribution in statistical surveys or experiments. It shows the linear variability or deviation of entire population from its mean or central location. The population mean is the average of all elements in the distribution expresses the common behavior of the entire members of data distribution. 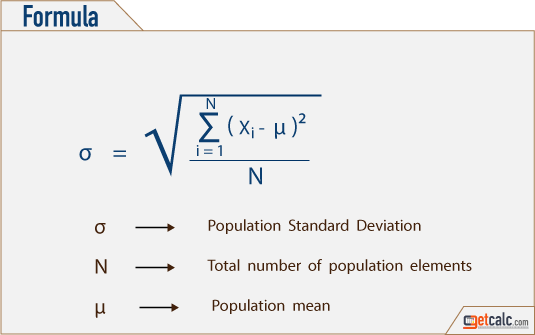 The population standard deviation is used to summarize the behavior of finite elements in a population. For infinite elements the sample standard deviation is used to analyze the data distribution to estimate the behavior of entire population. The finite population may indicate the monthly sales, annual sales, online orders etc. Use the population standard deviation calculator to measure the uncertainty of any finite distribution or generate complete work with step by step calculation for any valid input values. Z-score, standard error, Z-test statistic, student's t-test statistics are some of the notable statistics & probability functions rely on the population standard deviation (σ) of the distribution. The below formula is the mathematical representation to find standard deviation finite population. Find the mean, number of elements in the population and apply the values in the below formula to find the degree of uncertainty or how the entire elements of population deviates from its mean or common behavior of whole population.